It is that time of the year again. The time when we send our children off to school to learn, to grow, to socialize, to develop mentally, physically, and emotionally. School is not a replacement for the personal growth happening at home, but we would be short-sided if we didn’t believe that eight hours of their day didn’t shape who they are or who they will become. 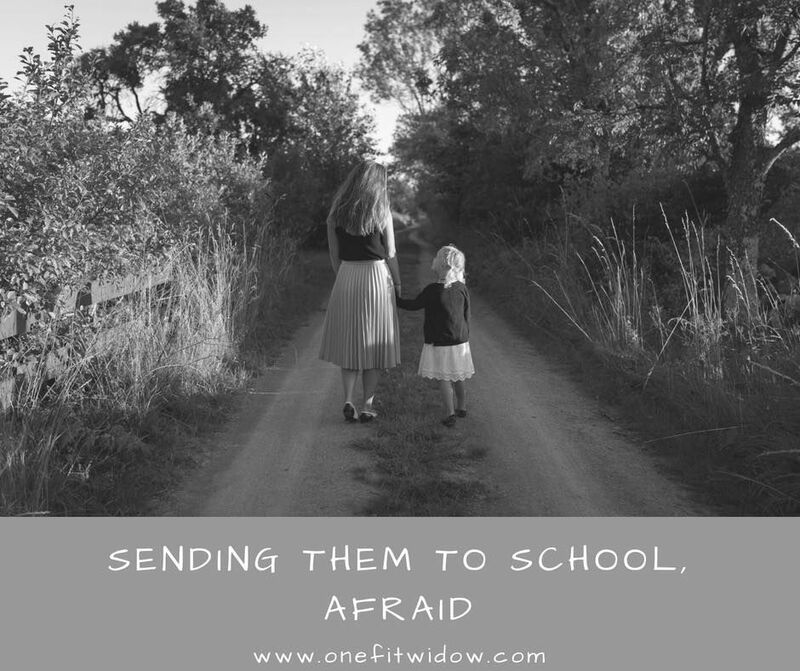 This year, more than any other year before, I’m scared, no I’m petrified to send my children off to school. I think I speak for a large percentage of American parents when I say, sending our children off to school has become a terrifying proposition. I’m downright astonished, dumbfounded and perplexed at the lack of outrage, anger, or a proposed change that I’m not seeing from the leaders in this nation. There have been more than 200 school shootings in recent years, hundreds of innocent, beautiful, amazing children have been murdered, their light forever snuffed out from our existence…tragic doesn’t even begin to express the pain of their stories. Yet, here we all sit, about to send our young children off for another year, hoping that we won’t become part of the skyrocketing statistics of death and carnage. Let me tell you about the false hope, and the crazy narrative we all believe, that bad things only happen to “other” people. Nearly nine years ago, two weeks before my daughters third birthday and just a month after my son’s first birthday, my husband, my children’s father took off in a small plane, and WE became that statistic. That thing you NEVER believe will happen to you, that tragedy you see on the news, that story where you feel so terrible for the family in pain, bad enough to ALMOST make changes in your own life…we became THAT family. My husband, father of my children, my best friend, he crashed, shortly after take-off and was killed instantly. Let me tell you right now, and I speak from a place of authority, bad things happen to everyone, including you and your family. We weren’t immune, and neither are you. I’ve spent nine years raising my children to thrive despite their loss. I’ve spent nine years building their confidence, their happiness, and their empathy for others. I’ve spent nine years making a choice to let them live despite the fear all parents harbor for the safety of their babies. I’ve tried not to helicopter, not to spoil, or shelter, and never to live with fear. I sit here tonight, fearful. I can teach them to rise above the kid who is mean to them. I can mold them not to care what other people think of their clothing, their personality, their sports ability or our financial status. I can lead by example, have the hard talks, hold their hand when they cry from defeat and cheer when they win. What I can’t do is shield them when someone walks into a place of education, a place they should feel completely safe, and points a gun at them, their friends, or their teacher. I can’t shroud them in a protective wall, and I can’t keep them safe in a place they go every single day. That terrifies me because I know we could be THAT FAMILY and so could you. So let me say this tonight, I’m so damn tired of writing articles and social media posts expressing my sheer pain and utter heartache for the death of CHILDREN in the United States at the hands of a peer. There are only so many words that I can say about grief and the horrific lifelong pain of loss, and I’ve said them all a thousand times and for thousands of kids. If I never, ever see another family torn apart, traumatized, and left forever changed, it will be too soon. It was too soon, long before the tragedies of Columbine or Sandy Hook. I’m not writing this piece for petty arguments or charged opinions that spew hateful words. I’m writing this because I’m sickened and I’m pitted at the bottom of my soul that parents are grieving the death of their children in a place they should have been safe. The fact that I’ve written similar pieces SEVERAL times already this year speaks volumes as to where we are and how far we have to go. The truth is our present-day reality is tragic beyond words, and it’s unacceptable beyond humanity. It’s inhuman and cruel and yet how quickly we seem to forget because it didn’t happen to our family…well, not yet anyway. I sit here tonight, and I beg of you to wake up America and realize, in a blink of an eye, you can become THAT family, and I know that without a shadow of a doubt because I’ve lived it. I can’t bring my late husband back; I’m can’t change my reality or the future for my children without their Dad. It’s part of who we are as “that” family. It’s forever. Tragically, it’s also forever for every family who has lost a child or been involved in a school shooting. I won’t keep them home from school, and I won’t stop them from living because of something that may never happen, but I am worried every single day I send them off to a place of growth, and that my friends, in and of itself, is a tragedy.